These are much skinnier than our original scalloped potatoes but still taste incredibly indulgent and are loaded with flavor. It's creamy and low fat. Score! Butter the bottom and sides of a 9x13 casserole dish. Using a mandolin, thinly slice potatoes into rounds about 1/8" thick. Place potato slices in a bowl with cold water while you prep the sauce. This keeps them from discoloring and removes some of the starch. Drain potatoes well, just before you put them in your casserole dish. 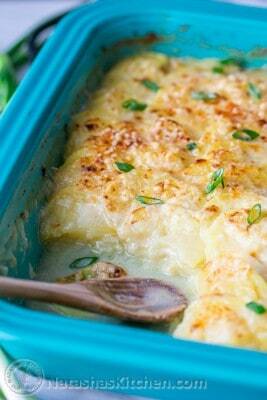 How to make Skinnier Scalloped Potatoes: Preheat Oven to 400˚F. In a medium sauce pan over medium/high heat, melt 4 Tbsp butter. Add finely diced yellow onion and saute until soft and golden (5 min). Add pressed garlic cloves and saute another 1-2 min, stirring constantly, until fragrant. Whisk in 2 Tbsp flour and cook another 1 min until flour is golden. Add 1 1/2 cups milk and 1 cups chicken broth. Whisk mixture until smooth and bring to a simmer. Stir in 1/2 Tbsp sea salt and 1/2 tsp pepper (or season to taste). Remove from heat. Drain potatoes and arrange half of them in the bottom of your casserole dish (it doesn't matter how the first layer is arranged, just separate the potato slices as you put them in). Pour half of your sauce over the top and sprinkle with 1/4 cup parmesan cheese. Repeat with remaining potatoes, sauce and top with 1/4 cup parmesan cheese. I made the second layer of potatoes prettier for presentation. Cover with aluminum foil and Bake in the center of the oven at 400˚F for 55 minutes then uncover and broil another 3-5 minutes or until the top is golden brown. Garnish with green onion if desired and serve.